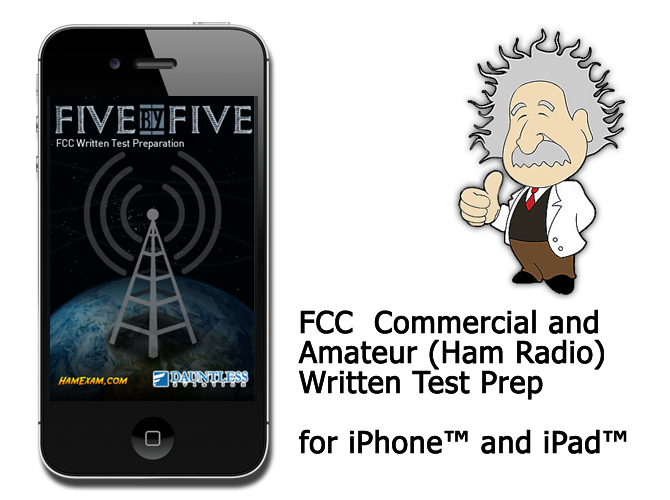 In addition to our PC and MP3 Audio offerings, you can now study for your FCC Amateur and/or Commercial tests using our Five by Five app for iPhone™, iPad™, and/or iPod™ Touch. FREE built-in updates that ensure that you always have access to the latest actual FCC questions. All charts and figures that you'll need to reference are included. Take as many simulated practice exams as you'd like! The apps are available via the Apple AppStore. Just click on one of the links above to learn more and/or to purchase. You can be studying on you iOS compatible device in no time! These iPhone/iPad apps are a great way to prepare for your FCC written test(s) while on the road. We think you'll come to appreciate the effort we put into making them easy to use. We realize that many of you would like to use the PC software while at home and the iPhone/iPad software on the road. Unfortunately, Apple's AppStore policy prohibits us from bundling the two into one purchase, so please accept our apologies as we ask for your understanding that if you'd like both that you'll have go purchase them seperately. Again, this is Apple's policy, not ours. To purchase the iPhone / iPad software, please click on one of the Appstore links above.